The easyCBM system was developed by educational researchers at the University of Oregon in close collaboration with school district partners across the United States. It is designed to give teachers insight into which of their students may need additional instructional supports as well as to provide a means by which they can measure the effectiveness of their teaching. System reports provide information that supports evidence-based decision making, and the Interventions interface streamlines the process of keeping track of students' instructional program, a feature that is particularly helpful for student study team meetings and parent conferences. The full District system includes a variety of curriculum based measures in the content areas of early literacy in both English and Spanish as well as oral reading fluency, vocabulary, and reading comprehension. In addition, it offers mathematics measures with reach to both the National Council of Teachers of Mathematics (NCTM) Focal Point Standards and the Common Core State Standards in Mathematics, with built-in read-aloud and Spanish translation accommodations. 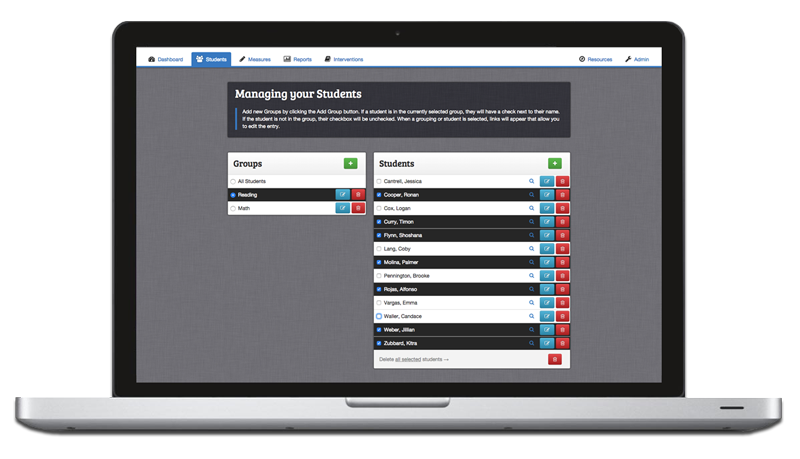 The Teacher Deluxe Edition offers the same features as the District version, but is optimized for individual teacher, rather than system-wide adoption. A truncated version, the Lite Edition, is available free of charge for individual teachers. Use of the easyCBM Lite and Teacher Deluxe Editions and this website (owned by the UO) is limited to individual users (parents, teachers, or researchers) and precludes district adoption or linking to or use of any UO names, identifiers, or marks in advertising with other products. You acknowledge and agree that you will be using easyCBM Lite and Teacher Deluxe Editions with students for whom you are directly responsible for teaching; it is not designed for building or district use across multiple teachers. easyCBM Lite and Teacher Deluxe Editions are described as research based instruments that may change based on research or feedback provided by users, and therefore, is to be used 'AS IS'. easyCBM Lite and Teacher Deluxe Editions are web-based benchmark and progress monitoring reporting services that permit you solely to enter student easyCBM data and administrative data (collectively "Data") and generate automated reports. Finally, you understand that information from easyCBM Lite and Teacher Deluxe Editions need to be supplemented with other information and professional judgment in making educational decisions that enhance student access to resources and the opportunity to learn. You grant the University of Oregon the right to use any de-identified data you enter into easyCBM Lite and Teacher Deluxe Editions for any purpose. You also grant the University of Oregon and its designees the right to use data you enter into easyCBM Lite and Teacher Deluxe Editions for the improvement and maintenance of easyCBM, and for research provided such research use of data is approved by an institutional review board regulated by the Office for Human Research Protections within the United States Department of Health and Human Subjects. No data transmission over the Internet can be guaranteed to be 100% secure and "hacker-proof," and easyCBM Lite and easyCBM Teacher Deluxe cannot ensure or warrant the security of any information managed by the site, whether transmitted to easyCBM Lite and easyCBM Teacher Deluxe by you, your school, or teachers. UO shall not be liable if a security breach occurs, if the site malfunctions, or if information is misused or mismanaged in any way to your detriment or the detriment of a third party, whether by easyCBM Lite or easyCBM Teacher Deluxe, your school, your teacher, or an unauthorized third party. It is your responsibility not to disclose your activation code, user name and password to anyone. It is your responsibility to use easyCBM Lite and Teacher Deluxe Editions only for the purpose for which they were intended. Any use of easyCBM Lite and Teacher Deluxe Editions not in accordance with the intended purpose is prohibited. UO does not provide a service to send your data to you when you decide to end your use of easyCBM Lite and easyCBM Teacher Deluxe or when UO ceases to provide easyCBM Lite or Teacher Deluxe Editions. However, UO ensures that your data are available for sixty (60) days after you close your account or UO announces that it will no longer provide access to easyCBM Lite and easyCBM Teacher Deluxe, so that an orderly transition can be made. Nothing contained in this Agreement confers any right to use in advertising, publicity or other promotional activities any name, trade name, trademark, or other designation of UO or BRT without the express written permission of UO. You agree not to deep-link to the easyCBM Lite or easyCBM Teacher Deluxe website for any purpose, unless specifically authorized by UO and BRT to do so. easyCBM Lite and Teacher Deluxe Editions were developed using Standards for Educational and Psychological Testing and through a program of research on student risk indicators. However, UO makes no representations or warranty on the accuracy, validity, completeness, or availability of information or results obtained from easyCBM Lite and Teacher Deluxe Editions. UO reserves the right to conduct further research on easyCBM to inform and make modifications or improvements at any time without notice. You agree that, if you participate in research or provide feedback to UO and BRT, the UO and BRT are permitted to use this information in making changes to easyCBM Lite, easyCBM Teacher Deluxe, and easyCBM. You acknowledge that easyCBM Lite and Teacher Deluxe Editions are solely an education information resource and is made available 'AS IS,' without obligation by UO to provide accompanying services or support. You acknowledge and agree as a condition of using easyCBM Lite and Teacher Deluxe Editions, that the information obtained from easyCBM Lite and Teacher Deluxe Editions is intended as a supplement to, and not a substitute for, your knowledge, expertise, skill, and professional judgment in making decisions to adjust and enhance opportunity to learn. UO AND BRT EXPRESSLY DISCLAIM ANY AND ALL WARRANTIES REGARDING EASYCBM LITE AND TEACHER DELUXE EDITIONS, WHETHER EXPRESS OR IMPLIED, INCLUDING BUT NOT LIMITED TO WARRANTIES PERTAINING TO MERCHANTABILITY OR FITNESS FOR A PARTICULAR PURPOSE. UO AND BRT WILL NOT BE LIABLE DIRECTLY OR INDIRECTLY FOR ANY PROPERTY DAMAGE, PERSONAL INJURY, LOSS OF USE, INTERRUPTION OF BUSINESS, LOSS OF PROFITS, OR OTHER SPECIAL, INCIDENTAL OR CONSEQUENTIAL DAMAGES, HOWEVER CAUSED, WHETHER FOR BREACH OF WARRANTY, CONTRACT, TORT (INCLUDING NEGLIGENCE), STRICT LIABILITY OR OTHERWISE. (Some jurisdictions do not allow the exclusion or limitation of incidental or consequential damages, so this exclusion and limitation may not apply to You).